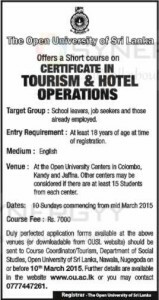 Open University of Sri Lanka invites applications for a short course on Certificate in Tourism & Hotel Operations for target to School leavers, job seekers and those already employed. Entry Requirement: At least 18 years of age at time of registration. Venue: At the Open University Centers in Colombo, Kandy and Jaffna. Other centers may be considered If there are at least 15 Students from each center. Duly perfected application forms available at the above venues (or downloadable from OUSL website) should be sent to Course Coordinator/Tourism, Department of Social Studies. Open University of Sri Lanka, Nawale, Nugegoda on or before 10th March 2015.